The NBA is currently in the process of redeveloping BloodNet from the ground up to ensure we improve speed and use of the system for the future. The redevelopment project, known as BloodNet 5, is aiming to release a range of enhancements, changes and improvements to the system. The new system is being developed from the current log of change requests and feedback from user research meetings undertaken by the NBA in early 2017. 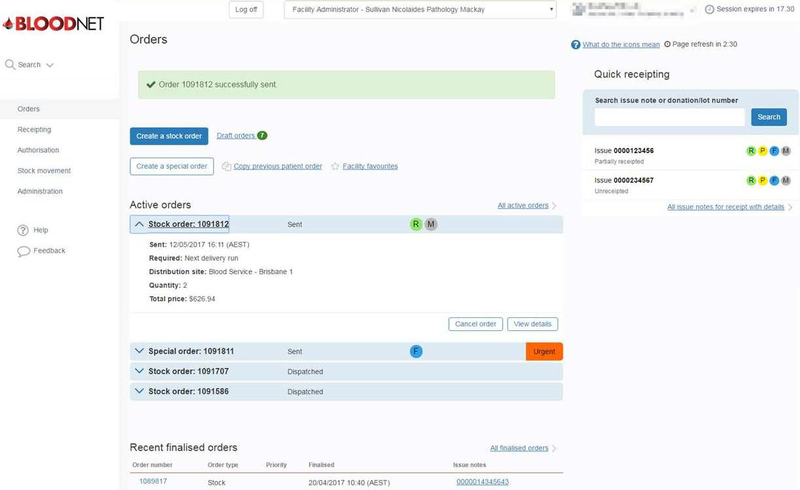 New features of BloodNet 5 have been recently demonstrated to the BloodNet User Reference Group, including the below screenshot of the dashboard that will replace the current ‘Orders by Status’ page. 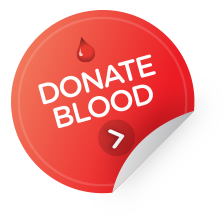 If you are interested in being a part of this redevelopment please don’t hesitate to contact the support team on 13 000 BLOOD (13 000 25663) or support@blood.gov.au to express your interest and/or become a member of the BloodNet User Reference Group. • All authorisation requests – Where a condition allows for a divided dose, the Requesting Medical Officer will have the ability to determine the quantity for each divided dose which will be reflected in BloodNET. This will affect initial authorisation, continuation authorisation, dose change and additional dose request processes. • Next dispense due field – a new field will be added on the Authorised Patients page in BloodNET called “Next Dispense Due”. This column will display the date of the patient’s next treatment and users will have the ability to sort patients using this field. a patient does not present or is too unwell for their scheduled infusion and their product is returned to the dispenser. 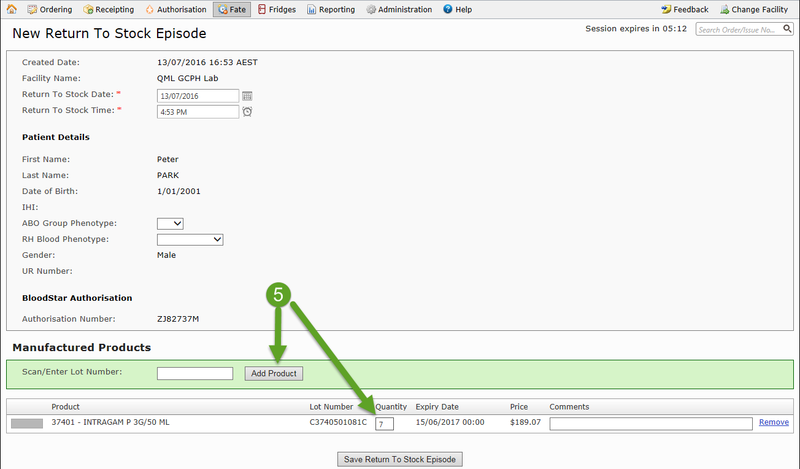 Please note: you must always use the Authorisation tab when completing a Return to Stock episode, never use the Return to Stock option from the Fate tab. 1. 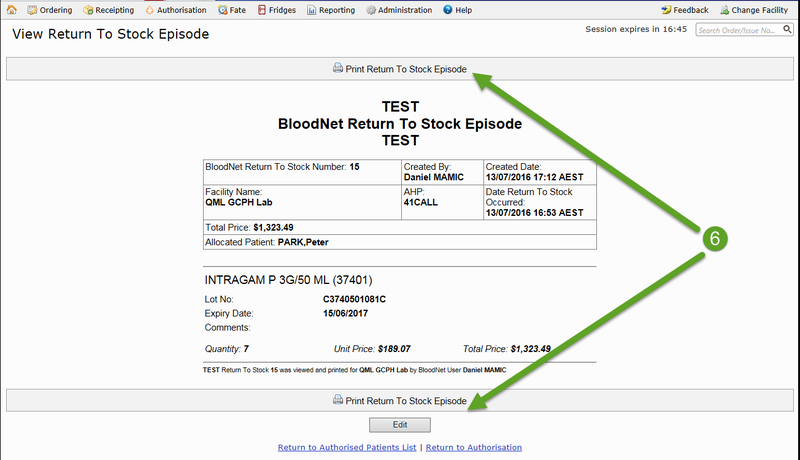 Login to BloodNet and move your cursor over the Authorisation tab and click on Authorised Patients. 2. The Authorised Patients page displays a list of all of the patients who have your facility listed as the dispensing facility in their authorisation request. Locate the patient you need to return stock for by scrolling through the list or by using the Search function at the top of the screen. 3. Once the patient has been located click on the Authorisation number in the Authorisation column. 4. The View Authorisation page contains details of the patient’s authorisation and their treatment plan. Scroll down to view the treatment plan and locate the dispensed product. Click on the Return to Stock link. 5. You will now be on the New Return to Stock Episode page. Scan the product(s) barcode and press the Enter key or click on the Add Product button in the green rectangle box under Manufactured Products. The product will appear at the bottom of the screen. You can adjust the quantity of productsif the lot number is the same by clicking in the text box in the Quantity column and entering the number of products you are returning. 6. Finally click on the Save Return To Stock Episode button at the bottom of the screen to save the episode. You will be taken to the View Return To Stock Episode page where you can print a summary of the episode or edit it. This detail has now been updated against the patients BloodSTAR Treatment Plan. Pathology North’s (NSW) LIS eBlood is the first ever BloodNet LIS developed and certified according to the newest specifications. The eBlood system accounts for 8% of total national product issues through BloodNet. Citadel Health has achieved BloodNet LIS vendor certification for its system Auslab. Queensland Health achieved BloodNet LIS Facility Certification with Auslab and went live on 6 June 2017. This system accounts for approximately 11% of total national product issues through BloodNet. Haemonetics has also achieved BloodNet LIS vendor certification on 7 June 2017 and is working closely with the Prince of Wales Hospital in Sydney. Cirdan (Ultra) is making final adjustments to its interface prior to vendor certification. Cerner is progressing with its development and testing and Intersystems (TrakCare) is updating the NBA on development progress with its interface and about to start testing directly with the interface. The NBA is maintaining open communications with all other LIS providers both identified and newly emerging to achieve BloodNet LIS interfaces.